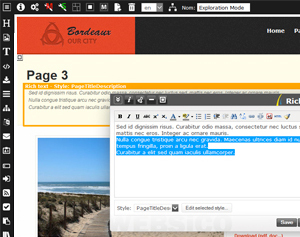 The "exploration mode" allows you to explore the websites created with WEBSICO, including this one, in simulated edition mode. So are exposed the features, elements and settings that produce the visible results. Each website becomes an example for anyone. The activation of "exploration mode" (<Alt> + F12 or <Alt> + Click on administration link) lets you fly over the elements and discover the meaning of icons. Clicking on an item gives access to its update popup and allows you to test a large number of actions and features. The documentation is available by clicking on the "i" button of the interfaces. This exploration is done without any risk to the website being explored because the save function has been disabled and the user has no access to the "administration page". The "exploration mode" can be blocked in the "administration page”.